I wrote this in response to a facebook discussion on whether Hurricane Katrina can be attributed to climate change. It is an argument I put together with limited time and research, but still valuable to answer the question..
August 29 marks 10 years since Hurricane Katrina. Leading up to the anniversary, we're reflecting using the hashtag #Katrina10. There is evidence and projections for increasing intensity of tropical cyclones (hurricanes. typhoons), but no change in frequency trend has been detected. There may be some small increase in frequency in some basins, but not in others. There is a trend for Cyclone tracks to be moving poleward, in both hemispheres. In terms of Hurricane Katrina, there has been no attribution study that I have been able to find to either rule climate change in or out as a factor for Hurricane Katrina. It was an extreme weather event still in the realm of natural variability. But it occurred in a changed climate system. It was part of the systemic change and long term trend in more intense Atlantic tropical cyclones (hurricanes) making landfall. There is increasing research saying there is a trend for more intense tropical cyclones (hurricanes) making landfall and that this trend is likely to increase to a certain saturation point with climate change. Here is a link to Emmanuel's 2005 paper published in Nature: Increasing destructiveness of tropical cyclones over the past 30 years (PDF). This 2005 report gives the basic climatological details of Hurricane Katrina. A good place to start. "We find that warm years in general were more active in all cyclone size ranges than cold years. The largest cyclones are most affected by warmer conditions and we detect a statistically significant trend in the frequency of large surge events (roughly corresponding to tropical storm size) since 1923. In particular, we estimate that Katrina-magnitude events have been twice as frequent in warm years compared with cold years (P < 0.02)." And lastly, Holland and Bruyère (2014) developed an Anthropogenic Climate Change Index (ACCI) to investigate the potential global warming contribution to current tropical cyclone activity. They found that the proportion of Cat 4-5 cyclones had increased by 40 percent for each degree Celsius of warming. An ACCI [Anthropogenic Climate Change Index] is developed as the difference between the global surface temperatures from ensemble means of model simulations with and without anthropogenic gases included. From this perspective the global warming signal appeared around 1960 and has increased to a current level of *0.8 C [as has previously been implied by Meehl et al. (2004, 2007, 2012) and IPCC (2007)]. We find an observed change in the proportion of global Cat 4–5 hurricanes (relative to all hurricanes) at a rate of 40 % increase in proportion per C increase in ACCI (Figs. 4, 5, 6; Table 1) using the IBTrACS global data set. This global trend is consistent with the observed changes in each tropical cyclone basin (Fig. 5) and the trends are significant at p\0.01 for the globe and p\0.05 for the majority of the cyclone basins. By comparison, a homogenized satellite data set and automated Dvorak analysis, together with two landfall hurricane data sets indicate trends of 20–30 % and these observed changes are consistent with a number of independent modeling studies (Table 1). We conclude that since 1975 there has been a substantial and observable regional and global increase in the proportion of Cat 4–5 hurricanes of 25–30 % per C of anthropogenic global warming. The increasing proportion of intense hurricanes has been accompanied by a similar decrease in weaker hurricanes and the development of a distinctly bimodal distribution in the proportions of hurricanes in each Saffir–Simpson category (Fig. 8). We suggest that this arises from the capped nature of tropical cyclones to a maximum value defined by the potential intensity, which increases only slightly with global warming. An important finding is that the proportion of intense hurricanes appears to initially increase in response to warming oceans, but then approach a saturation level after which no further increases occur. There is tentative evidence that the saturation level will differ across the tropical cyclone basins and that the global proportion of Cat 4–5 hurricanes may already be near it’s saturation level of 40–50 %. This has considerable societal implications that are being examined in a companion study. So Hurricane Katrina was an intense extreme weather event that matched the long term trend, although still within the range of natural variability. It provided a foretaste of other destructive Hurricanes such as superstorm Sandy more recently. 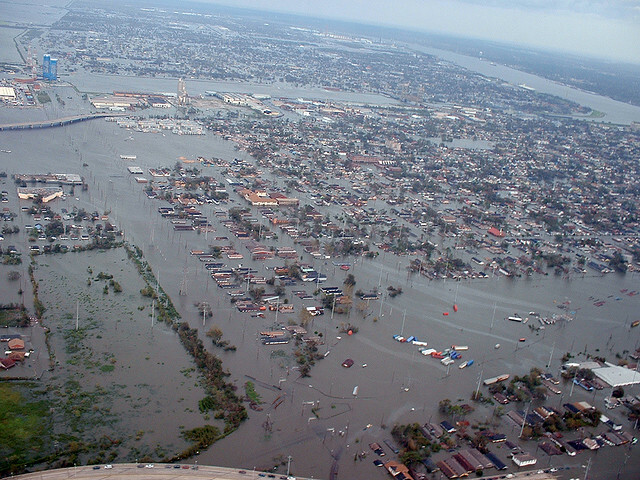 The real story is that Hurricane Katrina was a direct hit on New Orleans, a major US city. Infrastructure had not been maintained, emergency evacuation was poorly co-ordinated, and disaster response was slower than it should have been. The people that suffered the most were the poor, the elderly, and people of color. Eli Greig writing at Melbourne Indymedia in September 2005 labelled Hurricane Katrina as social and environmental blowback at the time. It seems it's destructive power is still reverberating on it's 10th anniversary.